25-pin Future Domain. This is used by some Future Domain cards (the ones without an M after the model number) and nothing else. 25-pin Macintosh. This is used by other Future Domain cards (the ones with an M after the model number). It's probably more useful from a CDROM point of view, since it allows you to connect external CDROM drives designed for (oldish) Macintoshes. Internal drives all seem to use the same 50-pin standard. It's safest if the drive you get is just a plain CDROM drive, not a CD-writer, DVD reader, jukebox or other weird drive. I discovered this when the first SCSI drive I tried turned out to support Panasonic PD discs. It reports itself to the system as two different drives (CDROM and PD), and the driver software sees the wrong one. A suitable SCSI cable, assuming one didn't come with the card. Drivers. For the Future Domain cards, you can download PowerSCSI from Adaptec's website. Otherwise you'll have to search around for suitable drivers. You'll also need MS-DOS 5 or later; or DR-DOS 7, or a recent FreeDOS. Once you have managed to collect all the necessary bits, start by making sure you've got the right version of DOS booting on your computer, and that you can start it from a floppy disc if necessary. Take a look at your drive and check its SCSI ID and termination jumpers. If it's the only drive connected to the controller, then its ID can be any of 0-6 and termination should be switched on. If there's another device (ie, a hard drive) connected as well, then the hard drive should have ID 0 and the CDROM any of 1-6. The devices at the ends of the cable should have termination on; devices in the middle should have it turned off. Normally the controller goes at one end of the cable and has termination permanently on. Just to confuse the issue, some internal cables come with their own terminator (the cable ends in a solid block rather than a plug). If you've got one of these, don't turn on termination on the device at that end. Switch off the PC, open it up, and fit the SCSI card and (if it's internal) the drive. This ought not to be too hard; the card goes into one of the ISA slots, and the drive into a 5.25" bay. If you have a PC1512 or PC1640, you will need to cut a bigger hole in the back of the metal casing in which the drive sits (or even remove the back of the casing altogether), so that the SCSI cable will go through. In theory you can get round this by folding the cable just so, but it's a risky business, may damage the cable, and will probably stop the drive from lining up with the holes in the casing. For an external drive, just plug it into the socket on the outside of the SCSI card. Only plug or unplug SCSI devices while the computer and the device are switched off! Once you've put everything back together, switch on and check that the computer still works. If the SCSI card does have a ROM, then it should list the SCSI devices it found, and one of them should be your CDROM drive. Now it's time to load the CD drivers. Take backups of your CONFIG.SYS and AUTOEXEC.BAT files. If you're planning to edit the copies on your hard drive, ensure that you can boot from floppy in case of trouble. DEVICE=A:\DOS\DCAM950.EXE /CA00 3 says that there's a Future Domain SCSI controller at address CA00h, IRQ 3. These settings match the jumpers on the SCSI card itself. I set the card to IRQ 3 so it wouldn't conflict with the hard drive controller on the motherboard. DEVICE=A:\CDROM\FDCD.SYS /D:MSCD0001 /F/R/Z says that there's a CDROM drive attached to the controller. The /D:MSCD0001 gives the drive an ID so that MSCDEX can use it (see below). The other bits (/F/R/Z) are options to do with scanning for the drive, and probably aren't necessary; it worked with them in, so I didn't take them out. The /D:MSCD0001 should match the driver ID used in CONFIG.SYS. The /L:R says that the CD drive will appear as drive R:. Because there is no /L, the drive gets given the next letter, which in this case is D:. (In case you're wondering: The hard drive is in the expansion bay, bolted to a backplate that used to be part of a hardcard. The GEM desktop isn't the one that comes with the PC1512 - it's FreeGEM). 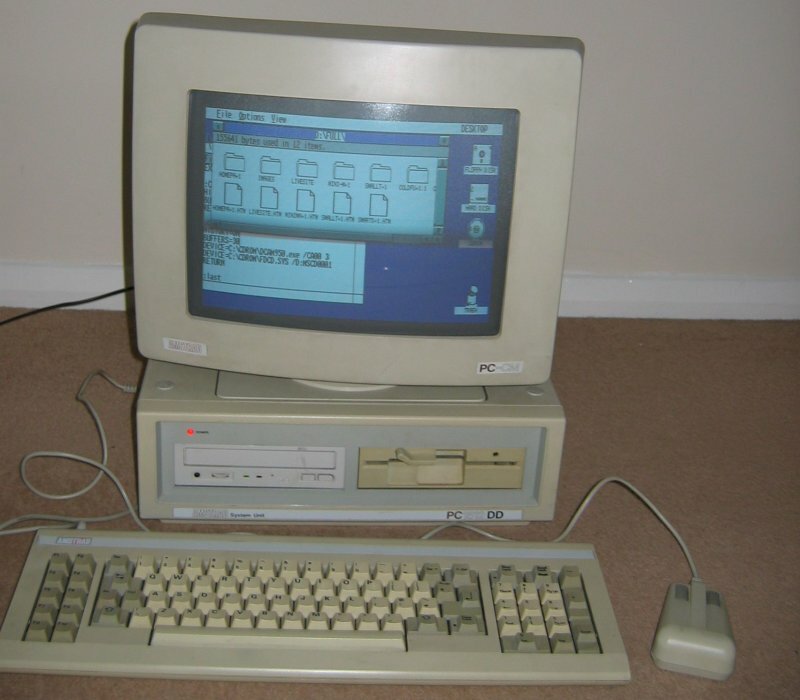 TMC-850 note: If you have a TMC-850, it can only boot from a SCSI hard drive on an Amstrad XT if the BIOS is version 8.2 rather than 8.4 or 8.5.